Raised in Raleigh, Cody Daniel has been engulfed in music and its possibilities of outreach for his entire life. Since 2009, Cody Daniel has been preforming in local bars and restaurants as himself and with dozens of local bands. He has collaborated with a wide variety of artists and through those endeavors he has crafted music in all kinds of ways. Now solo, Cody Daniel and his music are setting off to inspire listeners. Art uplifts and saves its audience from constant tribulations that overwhelm our lives. Music itself allots a beautiful emotional connection between the sound and the listener that offers a break from misfortunes. Our music gives my audience and fans an uplifting new sound that will always be relatable. Our music is one that inspires listeners the same way we believes music should always be inspirational and healing. The music video, "Love is a Lie", revamped the typical love song. It also won the 2016 Carolina Music Award for "R&B Music Video of the Year". Cody plans to take his musical ventures to the next level and isn't going to stop until he makes his mark on the world. His passion and love for music began shortly after Cody Daniel was born. His father a DJ, and other relatives in bands themselves, Cody was surrounded by various types of music at a young age. “At the age of when I could pick up objects, I would be playing along side them with little toy instruments and drums,” Cody mentions. He was always surrounded by top 40 and greatest hits dating back to as early as the 50’s. Cody’s real love for songwriting took place when he was 16 years old. Never taking guitar lessons, he took home his uncle's old guitar and began to teach himself to play. “I locked myself in my room everyday for months teaching myself how to play, while my fingers bled. I just remember engrossing myself in videos of John Mayer on AOL sessions. It was a way to watch his acoustic performances, and I instantly fell in love with his guitar style,” he says. Inspired by artists like Tom Petty, The Beatles, Foo Fighters and Coldplay, he tried to mimic everything he watched. Many of his early songs were formed from analyzing and breaking down other songs to figure out how they were made from chord structures. Unaware of the songwriting process, Cody would choose different parts of songs he liked, and use them to inspire his melodies and lyrics to make it his own. After much trial and error, and the hard work he dedicated, Cody now has over 100 songs written. His first performance playing guitar was in 2008 at his senior talent show. “I didn’t sing because I was too shy,” he says. But his determination did not end there. 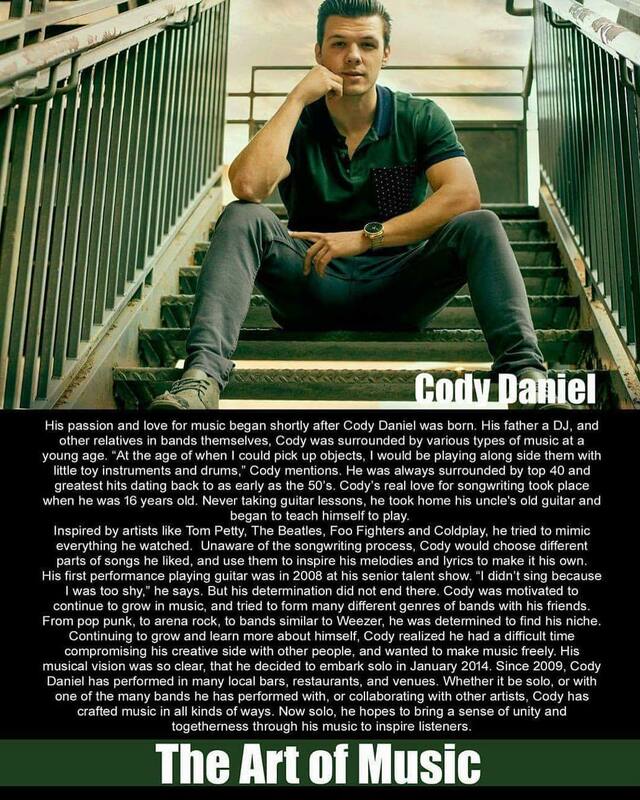 Cody was motivated to continue to grow in music, and tried to form many different genres of bands with his friends. From pop punk, to arena rock, to bands similar to Weezer, he was determined to find his niche. Continuing to grow and learn more about himself, Cody realized he had a difficult time compromising his creative side with other people, and wanted to make music freely. His musical vision was so clear, that he decided to embark solo in January 2014. Now, completely in charge of the production of his music and music videos, he is able to carry out that vision. Since 2009, Cody Daniel has performed in many local bars, restaurants, and venues. Whether it be solo, or with one of the many bands he has performed with, or collaborating with other artists, Cody has crafted music in all kinds of ways. Now solo, he hopes to bring a sense of unity and togetherness through his music to inspire listeners. Wish you have your favorite ringtone on your mobile phone. Share my collection with everyone. Hope my new update will bring a new look to the ringtone world, thanks!